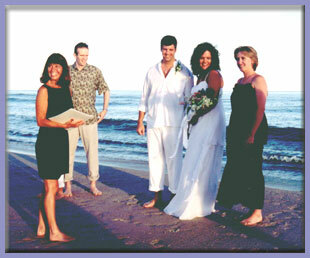 A PERFECT BEGINNING is a Florida beach wedding planning service that strives to offer couples just that -- a perfect beginning to a new life together. We are committed to providing the best possible personalized customer service so that you will have the wedding day of your dreams. My professional background has provided me with over 26 years of event planning experience of all types. In addition, I have over 10 years of experience in the local tourism industry, through which I have developed a solid network of contacts with hotels, resorts, restaurants, attractions, caterers, florists, and other related service providers. It was during the planning of my own daughters wedding in 1999 that I realized what a great time I was having and that I wanted to make this my life's work. On Valentines Day, 2000, I had my first beach wedding ceremony � an amazing sunset, dolphins and pelicans in the background and a very happy couple � it was truly perfect! I loved it, and knew that I was where I was supposed to be. Since that day, it�s been my mission to make sure each couples day is the very best it can be � A day you will treasure forever. A Florida Beach Wedding offers you and your fiancé an opportunity to reduce the amount of stress involved in the planning of your wedding. Hiring a professional who is familiar with the areas and the vendors can eliminate this stress and allow you to just enjoy yourselves. We will discuss what your dreams are for your special day, and then work within your budget to make these dreams come true. Our Wedding Packages are affordable, complete, and can be tailored to fit any specific requests or needs you may have. They range from casual simplicity to elegant traditional. With our Special Touches you'll be sure to find just the right combination for your dream wedding. If you�re looking for a more complete solution our Florida Wedding & Honeymoon Packages are sure to create memories for a life time. During the planning of your wedding, A PERFECT BEGINNING will be there with you every step of the way, keeping you informed, answering your questions, and making sure everything stays on track.�What do our clients have to say about our commitment to your special day? Read our Customer Testimonials and find out. My mission is to ensure your complete satisfaction on this most important day.